In Lincoln Federal, the U.S. Supreme Court considered challenges to North Carolina’s right-to-work law and Nebraska’s right-to-work amendment. As the court described these right-to-work provisions, "A North Carolina statute and a Nebraska constitutional amendment provide that no person in those states shall be denied an opportunity to obtain or retain employment because he is or is not a member of a labor organization." The provisions were challenged, "[O]n the ground that insofar as they attempt to protect non-union members from discrimination, the laws are in violation of rights guaranteed employers, unions, and their members by the United States Constitution." The unions’ most relevant constitutional claim for our purposes was that these provisions violated the 14th Amendment’s "equal protection" clause,* which basically requires state laws to treat people equally. The Supreme Court rejected the unions’ argument: "[I]n identical language these state laws forbid employers to discriminate against union and non-union members. Nebraska and North Carolina thus command equal employment opportunities for both groups of workers." 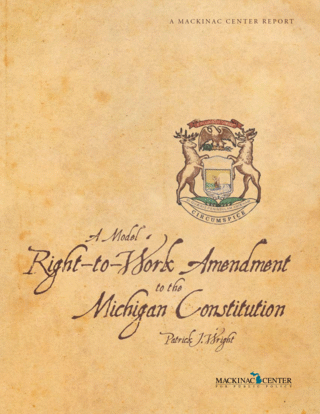 Thus, right-to-work laws containing both a union- and nonunion-nondiscrimination clause clearly do not violate the federal equal protection clause. In the second seminal case, American Sash, the Supreme Court stated, "A difference between the Arizona amendment and the amendment and statute considered in the Nebraska and North Carolina cases has made it necessary for us to give separate consideration to the contention in this case that the Arizona amendment denies appellants equal protection of the laws." The difference was, "The language of the Arizona amendment prohibits employment discrimination against non-union workers, but it does not prohibit discrimination against union workers." The unions claimed, according to the court, "[A] failure to provide the same protection for union workers as that provided for non-union workers places the union workers at a disadvantage, thus denying unions and their members the equal protection of Arizona’s laws." "[W]e are unable to find any indication that Arizona’s amendment and statutes are weighted on the side of non-union as against union workers. We are satisfied that Arizona has attempted both in the anti-yellow-dog-contract law and in the anti-discrimination constitutional amendment to strike at what were considered evils, to strike where those evils were most felt, and to strike in a manner that would effectively suppress the evils." The court’s additional analysis of Arizona’s other laws implies that without additional state laws that protect union members, a right-to-work law without a union nondiscrimination clause might be declared a violation of the federal equal protection clause.